The expectations for families to ensure spiritual development in children has drastically changed in the past few decades. I wonder what the cost of neglecting spiritual development will be to the world. I also wonder about the cost to the children themselves. Like everything else, organized religion is not perfect. Some people consider worshipping nature out in the woods or on the lake to be as good as worshipping in church. Other people are against attending religious services. Let’s take a look at the importance of early spiritual development and the benefits of attending religious services. Allowing children to decide for themselves whether or not they go to church seems to be in vogue. The excuse parents use is that children can decide whether or not to be part of a spiritual community when they are adults. This seems ludicrous to me. Children’s spiritual development is the parents’ responsibility. Children’s spiritual development is no less important than physical or mental development. We do not say, “Oh, it doesn’t really matter what I feed my children. I will feed them mostly highly processed food, fast food, chips, pop, and candy. If they want to eat healthily they can figure that out for themselves when they are adults.” No, we make decisions about the types of food we bring into our homes and at least attempt to get the kids to eat vegetables. We do not let them decide if they go to see a physician or get vaccinations, and if they have a chronic illness like diabetes we do not let them decide whether or not they get treatment. As parents, we take responsibility for our children’s physical development. We do not say, “I am not going to bother teaching my teenager to drive a car. If she wants to drive, she can figure that out when she is an adult.” We also do not let children decide if they go to school or not. So it makes not sense to leave it up to them if they go to church or not. According to studies on Blue Zones, religion may reduce stress and increase longevity. Many studies have found that a belief in God has a positive effect on mental and physical health. You can read a couple here and here. What we believe about God also affects our mental health. If we believe God is mostly a punishing, judging being, it does not have as much of a positive effect as if we believe God is a loving being who supports and helps us. Believing in a supportive and loving God also has a positive effect on mood and reduces anxiety. I believe that being part of a religious community is a part of raising a child to be a healthy and responsible adult. For Christians, a religious community is a church; however, all religions have some sort of ritualized gathering that is essential for spiritual growth. In the small farming town where I grew up, going to church on Sunday wasn’t considered optional. Now, whether or not to go to church has become a question for some families. Exploring the benefits of participating in a religious community may help to answer that question. In a healthy religious community, gratitude is valued and that has a positive effect on mental health. Being part of a community provides a sense of belonging and connectedness. Usually the values, or prosocial skills, taught in a church contribute to healthy relationships. At a very basic level, the ten commandments are good guidelines for living in relationships with God, self, and others. A good understanding of these values helps children make good choices throughout their lives. All religions have spiritual stories or teaching tales that tell us the history of people’s relationship with God. There is usually a creation story that tells how or why humans were created. In Christianity, Islam, and Judaism, we have the story of the destruction of the earth by flood. In Exodus, people leave oppression, face many hardships, and end up in the promised land. These stories teach that God has a plan for our lives and God is with us through the ups and downs. They teach that even when times are tough, things will get better. The stories have happy endings for the most part, but they also teach that, at times, life is hard. Hard times are part of being human, but times will get better. Yes, I realize there are exceptions to this. However, as a whole, most stories in most spiritual traditions teach this. 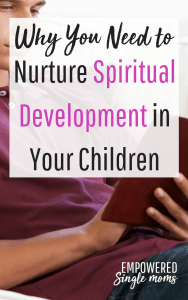 How Do You Provide Spiritual Development for Children? Being part of a religious community is a big part of spiritual development in children. Going to church teaches priorities, care for others, and discipline. There will be other caring adults to help teach by example. I know the church is full of sinners. Even at church, we need to be diligent about who we choose to be role models for our children. However, the chances of finding other caring adults with the values of care and respect for others and good decision making is high at church. 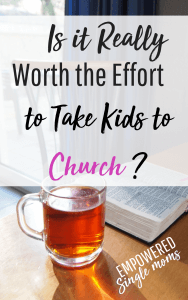 Yes, bring children to church is worth the effort. confirmation classes, and youth group activities. By being part of a religious community, you share the responsibility of your child’s spiritual development with other caring adults. When you are a single parent having a broader community to support you as a parent is a true blessing. You can use children’s Bibles and Bible story books appropriate for all ages to teach spiritual stories. Many families have a goal of family devotion time. That is excellent if you can make it happen. If you never seem to be able to make this happen, there are other options. You can include Bible stories as some of the stories you read when you have story time with your children. Prayer is important too. It is a time to talk to God, and as children get older you can teach them that there is another type of prayerful activity, a type of mindfulness that is listening to God. Lectio Divina is one of my favorite ways to listen to God and it is something that middle school children can understand. Spiritual development in children is as important as physical, emotional, and mental development. In fact, spiritual development contributes to a child’s physical, emotional, and mental wellness, and helps them grow into healthy adults. This article is part of a seven-month series, Secrets of a Successful Life by Single Mom Bloggers. This month we all wrote about an aspect of parenting. Check out the rest of the articles here and be sure to sign up for our newsletter so you don’t miss next month’s secrets.